Ten cabins in a two-masted traditional Turkish "gulet," perfect for Greek islands cruising. Photo from Peter Sommers Travels. Shopping for a meaningful, culture-focused cruise experience? Getting a little tired of those midnight buffets? Don’t fancy sharing your ship with thousands of your closest friends? We’ve discovered and “vetted” for you six small-ship cruises to (primarily) lesser-known ports, each journey so rich with authentic cultural experiences that they comprise once-in-a-lifetime adventures (sorry, no casino and no shuffleboard tournaments). Even if cultural cruises are not on your bucket list for this year, the stories below make for engaging armchair reading! And, stay tuned for six MORE enticing small-ship cruises — I guarantee you’ve never heard of them either . . .
We encountered no other American tourists during our 5-day cruise, and enjoyed strolling on riverside trails, and warm welcomes in local pubs in villages along the way. You don’t need to be experienced with boats to rent a nice cruiser—it’s easy, really! 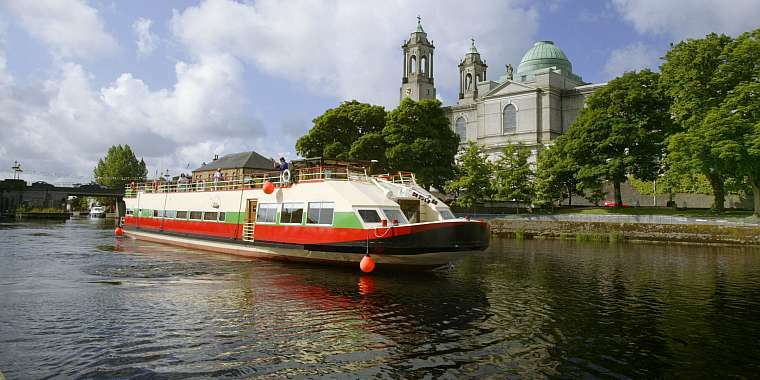 Another way to go: with your own group or as individuals, you can sail on the 10-passenger hotel barge, the Shannon Princess, which has five en-suite staterooms with windows; a saloon/dining area, and a sun deck. 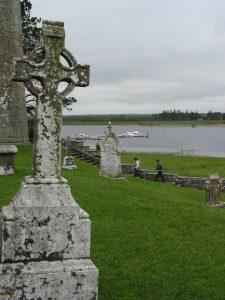 Guided tours of castles, estates, and historic sites, and artisans’ workshops, are included, along with optional pub crawls and walking and fishing expeditions. The Shannon Princess also offers golf-, walking-, cuisine-, and artisan-themed cruises. Even if you’ve been to Greece before, you may not have heard of cruising about on a gulet, which is a traditional Aegean motor-sail caique. The London Telegraph calls a Peter Sommer Travels gulet cruise one of the “Top 10 Cultural Holidays in Greece for 2017.” The company specializes in expert-guide-led gulet voyages in the Greek islands, Croatia and Turkey. This Fall, “Cruising the Dodecanese” promises to be one of the most enlightening and adventurous voyages ever offered through the Dodecanese chain, including eleven islands and numerous UNESCO World Heritage sites. 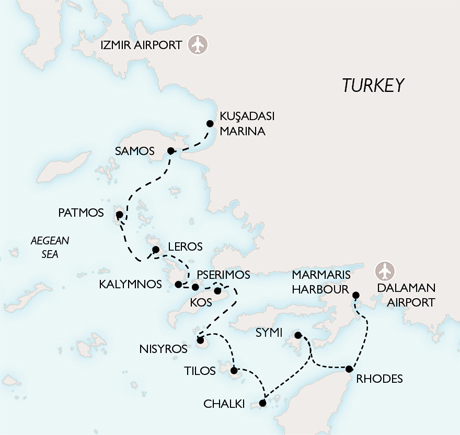 The islands are located in a unique and ancient crossroads that was visited or settled by Carians, Greeks, Romans, Byzantines, Venetians, Crusader knights, and Ottomans, making for a cruise itinerary rich with ancient sights, from the Asklepieion of Kos to the world-famous archaeological museum of Samos, and medieval fortifications on Rhodes. You will explore the acropolis and Byzantine monastery on Patmos, and anchor at the little port of Pythagoreio to see the sanctuary of Hera and the archaeological museum at Vathi, then it’s on to the Castle of Panteli on Leros, and a Crusader castle and Roman and Greek ruins on Kos. Your vessel is the “Oğuz Bey,” a Turkish gulet with a fabulous chef who creates traditional Eastern Mediterranean cuisine, and you will also enjoy authentic Greek food and wine in family-run tavernas along the way. You are advised to book soon, as Peter Sommer gulet cruises sell out, often to passengers who return year after year. Your exceptional guides are archaeologist and professor of history, archaeology and art history, Dr. Maria Girtzi; and Heinrich Hall, a popular journalist known for his reporting on archaeology and culture in the Eastern Mediterranean, and for his engaging personality (Hall is also the co-editor of the Blue Guide to the Aegean Islands). From £4,125 pp September 23-October 7. Launched in 2016, the ultra-luxurious “Champa Pandaw” has 14 teak-finished staterooms, premium amenities, and butler-style services, along with a master chef, and cultural and educational presentations. 14 nights from $6,300 pp. September 2017 – April 2018 (you must be able to walk easily). Offered for the first time is the opportunity to sail in luxury on the Upper Mekong River from Laos, through Thailand, into southern China—Pandaw River Expeditions is the first Western operator to reach China’s Yunnan Province via the Mekong, Among the unforgettable, culture-focused experiences on the “The Mekong from Laos to China” itinerary will be an architectural and market tour of the French–colonial town of Pak Lai; Ban Park Bor (Kmu Tribal) jungle village; and the UNESCO World Heritage city of Luang Prabang in Laos, with its many Buddhist temples, royal palace, and the National Museum. We feature another of Pandaw Expeditions’ cruises 2017 cruises here. In Thailand, the port town of Chiang Khong affords a visit to the Golden Triangle and Opium Museum. Crossing into China, enjoy dramatic scenery at Guan Lei Port, and arrive at Jinghong, founded in 1180, for rare cultural activities. Go to the Pandaw website for in-depth description of the itinerary and each port. Here is some fascinating background on Icelandic history. As you may know, Iceland is currently one of the most popular touristic destinations on the planet. Getting around on your own is certainly doable, but navigating the island by comfy cruise ship is the way to avoid the crowds and the tourist traps. This unique itinerary by Voyages to Antiquity combines Spain, Portugal, France, England, Scotland and Iceland—can you just imagine the ports on this 30-day, once-in-a-lifetime cruise from Seville to Reykjavik and back to Atlantic islands and London? Offered by Voyages to Antiquity, one of the most culture-focused cruise companies in the world, the “Grand Icelandic Voyage” is $8,750 pp including air from the U.S.
After the sights of Seville and Cordoba, you head to Lisbon and Oporto in Portugal, and make a stop in Spain to see the medieval town of Santiago de Compostela, then sail up the Gironde River to Bordeaux and on to Falmouth and Darmouth in England to explore Cornwall and WWII sites. Then it’s London, castles in Scotland, and 5 days of sightseeing in Iceland. On the way back to disembarkation in London are the rustic charms of the Faroe Islands and the Shetlands. 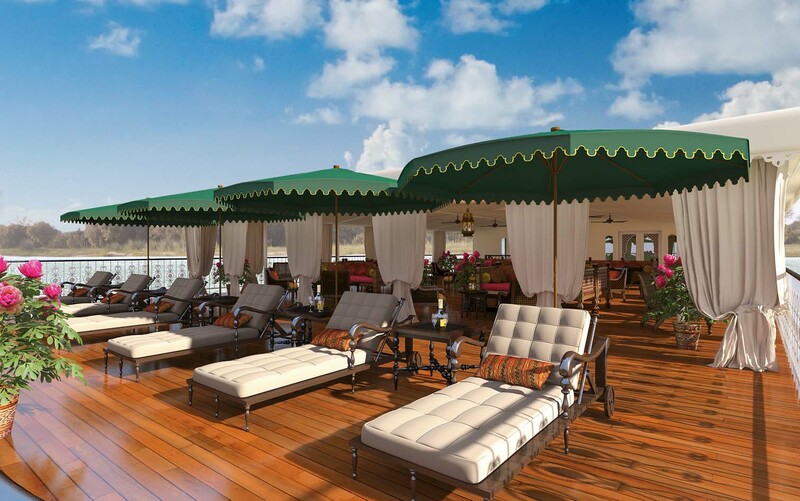 The sun deck on the Ganges Voyager II, a Uniworld ship on the Ganges Delta. Touring India does have its challenges, especially if you’re a little hesitant to travel in a third world country. A cruise with a reputable company is the stress-free, comfortable way to go, and now is the time to do it, as India is becoming a super-fast-growing cruise destination. Uniworld’s newish itinerary, “Golden Triangle on the Sacred Ganges” combines a relaxing, culture-focused voyage on the “Ganges Voyager II” through rural India with stops at the can’t-miss cities of Delhi, Agra and Jaipur. All-suite cabins for 56 passengers each have balconies on the 185-foot-long, three-decked vessel. To give you an idea of the cultural focus, on just one day, passengers debark at Murshidabad to tour vast 19th-century Hazarduari Palace and museum loaded with art and antiques, and take a horse-drawn cart to Katra Mosque and a sampan excursion to the village of Baranagar to see stunning terra cotta art in the 18th-century temples. YES, you will hobnob with master craftspersons; see the Taj Mahal, stay at a spectacular Oberoi hotel, and explore the colossal Vedic temple at Mayapur. You’ll take a sampan to Bandel and the Hooghly Imambara pilgrimage center; stroll along the waterfront promenade in French-colonial-era Chandannagar; and glide in a trishaw through the city of Kalna to see a spectacular collection of temples, including 108 carved, slope-roofed structures dedicated to Shiva. Most passengers add an optional 3-day sojourn in Varanasi. 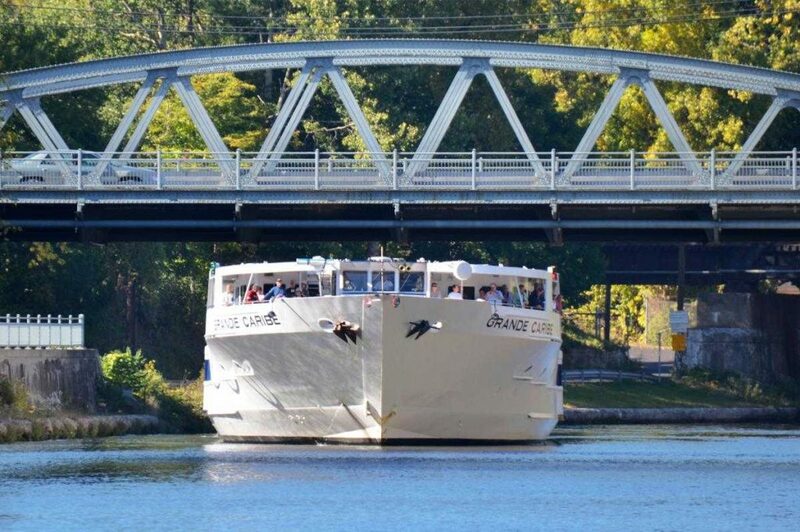 Sail north with Blount Small Ship Adventures on the “Grande Mariner” from Manhattan along the Erie Canal and the St. Lawrence Seaway through locks, canals and channels, all the way to Quebec City and Montreal—dates are in September and October when Fall colors are blazing. Pass the Statue of Liberty as you cruise the Hudson on your way to West Point, then FDR’s Hyde Park, and the Erie Canal where larger ships cannot navigate. Look forward to the Catskills and Cooperstown, the Oswego Canal and Lake Ontario, and the Thousand Islands. See antique boats and several museums, and cruise the St. Lawrence River into Canada to Quebec City—so many cultural and historic attractions here, with several guided tours available (one of my most fav cities­­—even in the wintertime). Then it’s on to Montreal for sightseeing and embarkation. The 184-foot-long, 83-passenger, 44-cabin “Grande Mariner” was recently spruced up with new cabin décor, bathrooms and furnishings, and a renovated lounge. “Locks, Legends and Canals of the Northeast” 14 days from $4,399. Stay tuned here for six more unique small-ship cultural cruises to lesser-known ports—that is, if you are ready to meet local people, try traditional cuisine, and make friends with fellow passengers who share your love of history and culture! And, where have YOU been cruising lately? Love to hear of your cultural adventures at sea or on a river. These all look like very interesting itineraries. Wish that more took advantage of the Great Lakes. Even though I often sail on the large ships, I make a point to immerse myself into the local cultural and foods, which often means just getting a block or two away from Diamonds International.